The stressfree 1000 mattress from bedmaster combines 1000 pocket springs in a king size mattress along with a layer of high density memory foam . 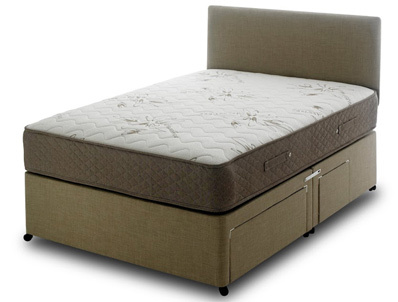 The stressfree mattress offers a comfortable medium feel with pocket springs for underlying support and a layer of both reflex foam and memory foam on top with a micro quilted top cover made from a jersey knit fabric. The mattress sits on a platform top hard base that is available in a range of fabrics , the base comes as standard as a non drawer although you can upgrade to a 2 drawer or 4 drawer if required. Please note the headboard pictured if not included but is available if required.